Do you have picky family members? Do you make a meal and almost always one child is not as thrilled as the others because of one little ingredient you might have put into the recipe? Well that’s my family. If I make a large baked oatmeal in a 9 by 13 baking dish and add one type of fruit, like blueberries for instance, I have one child who will not eat it. If I make it with raisins which I love, none of my kids will eat it! And then there’s the hubby who wants nuts and the boys are allergic. So you see this recipe came out of a DEEP desire to please everyone in my family! So everyone will eat what I am putting in front of them for breakfast and I won’t have to make 3 different breakfasts (which I really hate to admit I have certainly done, shame on me I know! My original recipe began in a large baking dish as I mentioned, delicious for overnight guests, can be made ahead, wonderfully yummy! But freezing it was hard because I didn’t like the size of it in my freezer. I then used that same recipe to accommodate it in portion perfect muffin cups because I was often eating to much of this yummy breakfast. I guest posted that freezer friendly baked oatmeal and you can find it at Money Saving Mom. This is the third and final version I am super happy with because the toppings are what wins everyone over! I made 4 plain, 4 topped with walnuts and added some frozen blueberries in the batter for the hubby, 4 topped with chocolate chips for kiddies and 4 topped with raisins for me!! This recipe is completely free of added sugar and lower in calories as well! I think this finally fits our family to a tee so I think it will be perfect for you and yours as well! Enjoy! The batter will look RUNNY, don’t worry! Freeze them in an airtight container or Ziploc bag after they have cooled. Thaw overnight in refrigerator for morning you want them. Spray the cupcake liners with nonstick cooking spray. Adding cream or milk over the top after warmed is very yummy! If you don’t have the stevia packets or powder only liquid, here’s the conversion chart. *PLEASE SEE THIS Q & A POST FOR FURTHER READER QUESTIONS ANSWERED AND SUBSTITUTIONS. THIS RECIPE/DIRECTIONS/PICTURE ARE UNDER COPYRIGHT LAWS AND MAY NOT BE COPIED FOR YOUR OWN BLOG POST USE. UPDATE 2-10-13: There has been much discussion as to why some people get more servings than 18 and why I have not. I’ve discovered that it depends on whether you use paper liners or silicone liners. Using paper liners more batter can be filled into the cups, more like 1/3 cup each. Where as using the silicone, only 1/4 cup of the batter will be filled. Using the silicone liners you will get 24 servings. Using the paper you will only get 18. I’ve included the nutrition info for both below. *Before you comment please see the Q&A Post for this recipe to see if your question has already been addressed. UDATE: 2/20/2014: I’ve remade this recipe and changed the amount of milk used from the original 2 3/4 cup reduced to 2 1/4 cup. Also please note I changed the 1 banana to 1/2 cup measured as the difference in size of bananas could have been the difference in why some of you were getting different amounts in this recipe. I also reduced the flaxseed from 1/4 cup to 2tbsp. With this change and without using paper liners or silicone liners, I sprayed muffin cups and poured 1/3 cup measure into each and filled 18. **Newest Adaption!!!! This recipe can be made in the CROCK POT!!! Check it out here: Crock Pot Personalized Baked Oatmeal Bars! I notice the directions mention vanilla, but it is not in the ingredients list? How much Vanilla should you use? These were excellant for a fast breakfast, I used brown sugar & walnuts on top. Also baked leftover batter in a pie pan with a struesel topping on the bottom of the pan. When done flipped it upside down, my son ate the whole thing. I used chia seeds rather then flax seed. Chia seeds are a superfood, and so much better for you then flax, and it doesn’t have the bitter taste, either. where can you purchase chia seeds? Do you have a Sprouts near you? That is where I purchased Chia seeds. Maybe Whole Foods or another health food store. I bought my chia seeds in the bulk section of Winco. I bought my chia seeds at GNC. We buy ours from either bulk barn or place an order with Azure Standard http://www.azurestandard.com/ (great source for CHEAP bulk items like xylitol. Amazon!! On your doorstep in 2 days and you don’t have to leave the house. Gotta love it! You can also buy chia seeds at Walgreens in their vitamins and supplement section. I also found Chia Seeds at Wegmans. you can get chia seeds at any health food store, but it is cheaper online if you check around. You can buy Chia seeds at any health food store or possibly in your health food section in your grocery store… I got mine directly from Bob’s Red Mill or you can get them from Amazon.com. HyVee has Chia seeds as well! iherb.com has various seeds as reasonable prices including chia seeds. Thank you, I was wondering what to use instead of flax. I’m allergic to flax seeds. I bought my chia seeds at Cost co.
What measure of chia seeds did you use? I’m so glad you said this because I only have chia seeds and really really want to try this recipe! It’s pretty neat little company and all organic. I didn’t have any chai or flax seeds and they still came out good will buy them eventually though because I know how good they r for you. Did you use 1/4 cup of chia seeds? 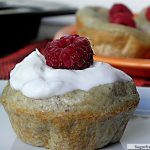 Hi, these sound delicious, and I noticed you posted that they are 18 calories each (without topping) however I did the math and for 18 muffins it came out to about 90 calories each. the 5 cups of oats alone are 1,500. how did you get around this? thanks for the info! How much pumpkin? I’m not a banana fan, love pumpkin though. Every fall I make my own pumpkin puree and freeze enough for the year. If you look at the “Other Recipes” I linked, I just made this with pumpkin. Are they suppose to be gooey? I baked them for 30 min. Had to put them back in for another 10, but they are still gooey inside. Also they did not taste like any thing I put in. How do yours taste? Store in the refrigerator until ready to serve. You can eat them at room temp so if you are having church then eating, I would remove them from the fridge and sit on counter for about 1-2 hours or simply reheat in oven. I wouldn’t recommend storing them at room temp. Do you have a version without bananas? I’m severely allergic. Same here. She did mention pumpkin above. I was also thinking all natural, no sugar added apple sauce, just less as it has more liquid. I would love any other suggestions! 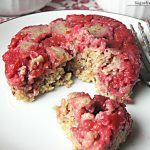 I used all natural no sugar added applesauce they are delicious thanks so much for sharing this awesome recipe I topped mine with frozen triple berries and stuffed them inside the oatmeal then covered the top with the same oatmeal so when u bite through them u can taste the oats with the juicy fruit sooo good. Thanks again! They smell soooo good when they are baking and taste even better. Thanks for the great recipe! I also wound up with 30 but figure I can have 2 per serving which is even better! Maybe it has something to do with the brand of oatmeal you use. (I used Great Value from Walmart) I also used flax seeds (2 tablespoons) because I didn’t have flax meal and topped them with dried cranberries. Next time, will add pecans or walnuts to the batter. I have an extra coffee grinder I use to make flax meal from flax seed. Flax seed needs to be ground up to be used by the body. How much of the chia seeds did you use? Only flax oil should not be cooked. It also says to get the nutrients from flax seed, it should be ground. Hi Amanda, THANK you so much for finding this great article! I will share the link above in the post for others who question the use of flaxseed and cooking. The amount of milk is not mentioned. I am assuming it’s just enough to incorporate everything together? 1/4 – 1/2 cup, or would it even be that much? I used unsweetened almond milk and they turned out great! I have two family members who are allergic to bananas…and I’m one of them. Is there something else that I can substitute for the banana? How about applesauce? You could try maybe a cup of it and see how they come out. Reduce everything to make less instead of 18 in case they don’t come out well. I second the pumpkin idea! Did you try it? I don’t have bananas in the house right now so using pumpkin this afternoon. I’ll let you know how they turn out. What about sweet potatoes? Or yams? I make a baked oatmeal (similar but not the same -I use 3/4 cup brown sugar instead of stevia or honey) and do not use bananas at all. I think you can omit it completely without adding/substituting it and it won’t alter the recipe. Give it a try – Good luck! I also got about 24 muffins using 1/4 cup measure. maybe 1/2 cup pumpkin. Bet that would be yummy! Works as a binder like banana. pumpkin would work too, but you will taste it in the oatmeal. I love pumpkin, but I know some are sensitive to the taste. I am allergic to bananas too, but I can eat them if they are cooked. I know this may not be true for everyone, but I just wanted to mention it. I don’t know what it is that changes once they are cooked, but the same is true for me with carrots. Interesting! Two of my children are VERY sensitive (in my mind, allergic) to banana, but only raw. Once it is cooked it doesn’t bother them at all. My child was just diagnosed w/banana and carrot allergy. He too can eat them cooked. It is due to the change in the protein that they have a reaction too. It’s changed when they are cooked. But ALWAYS check with your allergist first! My husband is allergic to bananas, but can eat them when cooked. My son is also allergic to bananas, but when they are cooked they still make him get sick… not as severe. Our allergist said it is due to the severity of his (my son’s) allergy and being more sensitive to the banana protein. The allergy is called Oral Allergy Syndrome or Pollen-Food Allergy. It’s when a person is allergic to the pollen on the food. Cooking food can eliminate the pollen. I wish I could help you but my family only has allergies to nuts and soy so I really would not know a replacement for eggs. Sorry! Thanks, I can’t eat eggs and was wondering that too. When I was vegan I used Energ Egg replacer to subsitiute for eggs in recipes. It’s a powder that you mix with water. You can find it at natural food stores and in the baking aisle of some grocery stores. My mom was allergic to eggs, we used the Egg replacer mentioned by Ali. Lots of recipes and suggestions on the box. Worked best if you let the replacer and water sit for a few minutes… Snot like. The product is a potato starch. You can also make egg substitute from chia seeds. Combine one tablespoon of chia seeds and a quarter cup of water. I just made these and I think they’re awesome. Before I baked, I read several comments. I noticed the one about how many you will get. I measured exactly, used cupcake papers, and I got 30 papers almost full to the top. Also, saw the comment about putting them in a bowl when warm with milk. OH, YEAH. So good. Also, I used homemade applesauce which has a tiny bit of honey in it, so, I only used 4 packets of stevia. 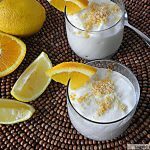 VERY GOOD RECIPE!!!! You can replace egg in most recipes that call for 2 or less with 2tsp baking powder and 2tbsp milk. If the recipe calls for baking powder already reduce to 1 1/2tsp baking powder, milk stays the same. I’ve used it lots as my niece used to be allergic to eggs. and it works wonderfully but it only calls for one egg – good luck! You can replace eggs with mashed bananas when baking. Each egg is about 1/4 cup to let you know how much mashed banana you would need. My daughter is allergic to eggs, among other things. Ordinarily I would use flax seed+oil+water, or applesauce, or banana to replace eggs in a recipe like this, but since they are all in there I think it may work for us to just leave the eggs out (and I might use a bit of EnerG egg replacer for some loft). It could change the final product somewhat, but we are used to that! In the original recipe, do they come out acting like cupcakes (you can hold them in your hand and eat ’em) or would they need to be eaten with a spoon? They are more like a muffin you can hold. Warm though out of the oven I usually place them in a dish and pour a bit of cream over the top and eat it with a fork. When I was vegan, we replaced eggs in baked goods with 1 T soy flour and 2 T water. Subbing some of the flour in breads and cakes with soy makes them stay fresher longer, too. Plus, higher protein, lower in carbs! Love it. I’ve used the Ener-G egg replacer for baking. It is actually cheaper than using eggs. Instead of Eggs you can purchase ENER-G Egg Replacer. You won’t even know there aren’t eggs in any of your baked goods. Looks delicious! Can’t wait to try! the stevia conversion chart too. I saved it and will be referring to it often. These will be good, I can tell! I love that you can freeze them! I might try some pumpkin instead of banana or applesauce. We buy an organic blackberry applesauce that will be yummy in this. Thanks for this recipe! Shelled pumpkin seeds would be yummy on top, too. These look so delicious! For those with food allergies, they can place 1 Tbsp. of flaxseed meal in 1 Tbsp. water for each egg as an alternative. I love baked oatmeal! Thank you so much Laura for the tip on replacing eggs! What a neat idea!!! Looks delicious too! This sounds great!! I don’t have flaxseed meal, can I omit it or substitute something else? You could probably omit it and you’d be fine. I was wondering the same thing, thanks! I made these tonight and didn’t have bananas so left that out and used wheat germ in place of the flax seed. It worked great and we all loved them!! Thanks or the great recipe! What a great way to please the family and have breakfast and snacks ready to go anytime! I love this and the “portion-sized” baked oatmeal recipe. I find that you can play around with ingredients with no problem. I also, cut the sweeteners in half, if not more, as the fruit really adds a lot of sweetness. Made this for my train trip – it was a great. These look yummy, BUT you should not be calling them “gluten free” unless you specify that only pure oats be used. The only oats guaranteed as such in Canada, for example, are the ones sold by Cream Hill Estates. These are subjected to testing by the Canadian Food Inspection Agency. Check the Canadian Celiac Association website for more details. Thank you for the recipe! most people who are GF know what oats they can and can’t eat 😉 Not everyone who is GF needs to avoid oats. I, for instance, do fine on oats as long as they’re whole oats and not cheapy off brands or quick oats. Being GF isn’t hard at all. It Just requires mindfulness. Yes, I agree most GF do know what oats then can have, but of course I had many comments from people stating my recipe wasn’t gluten free so I felt the need to clarify above. Thanks for sharing! Oh, can’t wait to try these tomorrow morning! I bet the kids will love them! Toppings? Hmm…I can do a variety! Yeah! And I like the idea of using pumpkin someone mentioned. I make a pumpkin muffin with instant maple and brown sugar oatmeal sprinkled on top that the kids love! Thanks for sharing! I love how they are individual so everyone gets what they want and no one has to compromise. Just made these this morning. They were so good!!! We all loved them. Quaker Oats are not gluten free. This may fool newly gluten free people into thinking that they are. I do plan to try this recipe with Bob’s Red Mill gluten free oats though. This sounds great. Trader Joe’s also has gluten free oats now…they are the regular oats they sell with the other cereal, but are marked gluten free. A lot less $ than Bob’s Red Mill, if you’re on a budget. These look delicious! Do they taste like oatmeal muffins? I don’t have Stevia, but I do have Splenda packets. Will they work the same? I don’t use Splenda because it is artificial but I’m sure it will work but I don’t know how much you should put in the recipe. Do you really need to substitute 1/2 to a whole CUP of honey for a teaspoon of Stevia? I used a half a cup of honey and was just fine with it and my kids are fine with that. But some people are very used to sweetness and a half cup would not even come close to the sweetness they are used to. The half cup honey is comparable in sweetness to the amount of stevia but the stevia has just a tad bit more sweetness, especially using a flavored kind. does subbing the honey for stevia change the consistency? Adding all that extra liquid is bound to make a difference, no? Should any adjustment to cooking time be made to compensate? I have made them with 1/2 cup honey and also with just stevia. No adjustments on time were needed in my oven and they always come out perfect at about 30 minutes. Can you use almond milk in place or regular milk? I’ve been wondering if you can bake with almond milk! I didn’t know! Oh yes you can use almond milk and I would if my boys were not allergic to nuts. I’m excited to try these! I am gluten-free casein-free…use almond milk in place of regular milk all the time. Thanks for this recipe! I have never liked to eat oatmeal because of the mushy consistency. I know it is good for you and have tired other baked oatmeal recipes without much luck. These look great! What kind of consistency do they have–muffin like or still a little mushy? More like a muffin I think you will love them! I have the same problem. I know oatmeal is good for me but can’t stand the consistency. These are sort-of like bread budding in consistency, though. They don’t have that mushy / slimy texture. I’m very pleased with mine! I feel the exact same way: envious of anyone who can stand the consistency of oatmeal and therefore benefit from the goodness it provides! 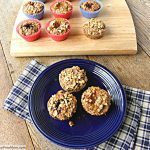 oatmeal always brought a slimy, unappetizing meal to mind while seeing these baked oatmeal muffins has me picturing a sweet smelling kitchen and a quick solution to breakfast and snacking. Thank You!! If you don’t like the slimy feel/texture of rolled oats, you should give steel-cut oats a try. They are much chewier – I love them! If you have a Trader Joes nearby you should give their oatmeal a try. (if you want to eat oatmeal but do not like the mushy slimy oatmeal.) They have one there called country choice organic multi grain oatmeal (it has rye, barley, oats and wheat in it) it is SO good! I was the same way as you before I found this oatmeal and now it is my favorite meal for breakfast! (best cooked on the stove with 1 teaspoon brown sugar and fresh fruit on top). I’ve used it, very good! Made these but I have to say, your recipe made WAY more than 18. Also, mine was super soupy. Is that how yours was pre bake? Mine are baking now… Hope they turn out! I used a few dark chocolate chips, toasted coconut raisins and cinnamon sugar. A good variety. Yes, they always do look soupy but that’s why they are so moist. I don’t know why you got more than 18. The texture is much better than regular oatmeal, more like a muffin. Let me know how they came out. WOW! I filled my muffins up to the top. I have a regular muffin pan. I don’t know why you got some many! Yes, just reduce the calories by half then, good for you! I have regular muffin tins to and it made 33 muffins for me. We are allergic to milk so I used coconut milk and they tasted wonderful! Thanks for the recipe. I also just made these and ended up with 24 regular size and 18 mini-muffins! They are absolutely delicious though, so I’m glad to have so many more! I made these over the weekend and got 30 muffins. I have a standard-size muffin tin, and used 1/4 cup measure to fill them. These are WONDERFUL! I made blueberry, raisin, chocolate chip, and coconut chocolate chip. Once my son gets his braces off (5 more weeks!) I’ll experiment with some nut toppings, as well. Thanks so much for the great recipe! Maybe all the baking powder. I got 24 muffins and a pie plate full! (I ran out of tins). I’d like to try with pumpkin next time instead of banana–about how much pumpkin do you think? We do not have a microwave. Will they reheat the same in the oven? They may dry out a bit. Try them in a preheated oven at 325 degrees and let me know how they works for you. These look really good. I’d be the only one eating them in my house but freezing them means I can grab and go when I need a snack. Thank you for sharing! Yes its just for sweetening. feel free to exclude if you are fine without it. I don’t use sugar substitutes. Has anyone made this with brown sugar of strawberry jam or something other than stevia? I made them last night with 3/4 c brown sugar. Perfect! I used 1/2 cup of raw agave…they are in the oven now and looking great! I just used 3/4 cup brown sugar and when I tasted the batter I found it a little sweet for me. They are in the oven now and they smell so good. Can you use egg whites instead of a whole egg? I haven’t tried but I think it you would need at least two whites to equal one whole. You mentioned Points +. Is this a WW recipe?!?!?! I am a Life time member so all my recipes have weight watchers points. These are original recipes of my own. I’m getting 4 points per the WW site – how are you getting 3? I don’t always trust the site because it quoted me 6 points on an apple recipe that should have been 2 but I thought Id ask. I used nutrition data to get all the info first and then I also got 4 points plugging in my info with my point calculator, but when I went to the weight watchers site online and plugged in all the food, it came up with 3 points, I don’t know why it was lower. I think I’ll go with the online points! LOL. Can’t wait to try these, they sound so yummy! I am a life time member of WW but it is not their recipe. It is an original I created. Any idea what the points + value would be roughly? I can’t wait to try these. I have a 15 year-old that I need to feed in the morning and I need a quick and easy breakfast. I have used agave 1:1 for honey in my baking before, taste depends a little on if you got light or dark, but I don’t notice a difference. It tastes very similar to honey. Do you think one could make this with quick oats instead of old-fashioned? Thanks! Looks great! Yes, you can but they may be a bit more mushy, still good though! I used Quick Oats and I think they turned out great! I just ate one, and it was really moist on the inside, almost to the point where I thought it might not be done. The toothpick came out clean, so I’m assuming it’s just a wonderfully moist muffin! I also used: almond milk, honey, and omitted the flax seed because I didn’t have any on hand. Didn’t mean to post this twice…it wasn’t there before…oops. I am sure it could be used but I do not use agave in my recipes at all because it is highly processed so I would not be able to tell you how much to use for this recipe. Sorry! The bottle says “raw” on it. Are there different kinds of agave? I thought raw meant not processed, but I’m not sure. Thanks for your info. I do not use agave at all. Sorry! The FDA allows the label RAW to be put on any product that is not cooked at a temperature of 114 degrees or higher. A real eye-opener and a very clever marketing campaign to imply these products are natural. I would HIGHLY recommend either honey or stivia in place of agave. These look amazing! I love all things oatmeal…love the way you can make each one different! Do these “eat” like regular oatmeal or like a muffin? More like a muffin! You will love it! These look great Brenda!! I too, have a variety of taste buds at my house so individual servings would work out great. Thanks! As someone else posted, this recipe made more than 18 for me (my batch yeilded 18 regular sized, plus 16 mini-sized). Not a problem, since they are crazy good! I added chopped apple right in the batter, and omitted any sweeteners (the applesauce and apples were plenty sweet!). I used unsweetened vanilla almond milk and it worked fine. The only thing I’ll change next time (and there will definitely be a next time, since these will go FAST! ), is to add my walnuts to the batter along with the apples. I sprinkled them on top, wanting that roasted walnut flavor. While it was delicious this way, the nuts fall off!! Maybe I’ll mix some in the batter, and sprinkle some on top – or roast them before putting them in the batter. Really great (and easy and healthy!) recipe! Thanks for sharing! I saw this recipe and wondered if chopped apples would work. Now I know and can’t wait to try it out. Can’t eat oatmeal the regular way so I’m hoping this is an easy way to get oatmeal into my day! If you’ve liked them sweet I would add one cup honey. Did you know that stevia is all natural and sugar free? Its a plant and the leave are boiled down to produce it. I used 1 cup of honey and my muffins ended up so mushy I had to eat with a fork, and they stuck to the liners really bad. My batch also made 36! I will try to fill them to the brim next time and exchange brown sugar for the honey. Thanks for the amazing recipe! I think you may want to do a cup of honey instead. You can always reduce the next time if its sweet enough. My kids have never said anything is too sweet LOL! I am definitely going to make these tonight for my new go-to breakfast idea! Also, I never comment on blogs, but I just went down the list of comments and read them all for some reason, and thought you should be told about how wonderful of a blogger you are! You responded to pretty much every question and post! Keep up the great work and recipes! I’m very excited to try them out! Thank you so much for the compliment! I try my best not to miss any questions, but sometimes it happens. Hopefully most will understand it was a mere accident as I get so many comments I sometimes am only able to read them at the moment and not comment. When I have the moment to go back they sometimes slip through the cracks unfortunately! Thanks again, you made my day! I don’t know how much you could use because I am not familiar with it. I would think it is comparable to stevia though. Start with a small amount. Have you used it in coffee? I use only 3-4 drops of stevia in mine. How much would you need to sweeten coffee? Xylitol is supposed to be equal in weight to sugar, not stevia. So my guess is that you would want to use a measurement that is equivalent to what you would do for sugar. I saw one poster say that they used 3/4 cup of brown sugar, so I would try that and see how it tastes. I would love to hear how it works out. I’ve been wanting to try xylitol. Thanks for the recipe, Brenda. Can I make this without the flaxseed meal? OR what can I use in place of it? Just have everything but that and didn’t want to do out and buy it! You can leave it out without a problem. I use it mostly for the added fiber and healthy benefits in recipes as much as I can. I made it without and it was fine. A little softer than I would prefer but still great. Oatmeal muffins!!! Oh my goodness, these look amazing and I want tomorrow morning to be here NOW just so I can make these!! I am trying to get my daughters to eat more oatmeal because I love it so much….I bet with some Ghirardelli chocolate chips as a topping they would devour these! Thank you! This is such an awesome idea! I can’t wait to try it! It sounds like a great way to shake up breakfast and not eat the same ol’ thing! Thank you for sharing! Hi! I love this recipe, can’t wait to try it. I’m allergic to bananas though… any recommendations on what to replace them with? Thanks! some have asked the same thing and mentioned possibly pumpkin or increase applesauce to an extra cup. Perfect, thank you! I’m trying tonight, so i’ll let you know how the extra applesauce goes. I’m a little confused by the nutrition facts. You said 18 servings but you made 16 muffins. Did you use all the batter or did you have some left over? No I made 18. I made 4 plain, 4 blueberries, 4 raisins, 4 chocolate chips in my 12 capacity muffin tin and then another 3 more chocolate chip and 3 with raisins in the 6 capacity tin. Sorry I didn’t specify better! Just baked these yesterday, and they are DELICIOUS! Perfect fuel right before a workout! Does this really say that they only have 18 calories (without toppings of course)?? That is great if so! Nope that is for the servings. Is a serving then one muffin at 18 calories? 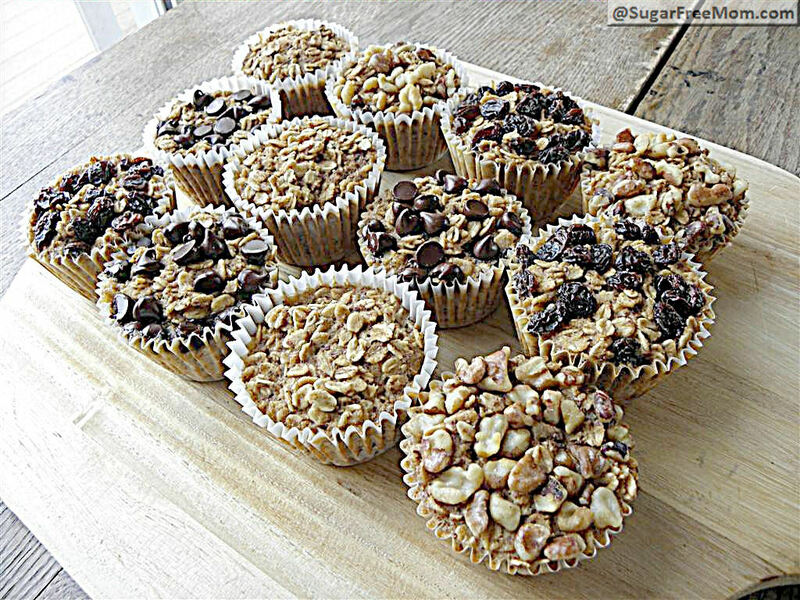 How many muffins equal the weight watchers 4 points? I can’t wait to make these. I need some good ideas for breakfasts. I don’t use Stevia. A cup of Honey seems to be a lot, are there any other suggestions for low calorie sweetener? Okay, so I really want to try these and I have read most of the comments and checked to see if this allergy was mentioned yet but it wasn’t. I’m allergic to apples so the applesauce is definitely out for me. What could I substitute for this? I was thinking banana, but I was also thinking about some other type of fruit puree. Could I substitute coconut? I use the applesauce in place of using oil or butter so you could replace it or use another pureed fruit. I didn’t use bananas or applesauce. I pureed one nectarine, one pear and one cup of pineapple cubes. They are fabulous!! I think this is brilliant! 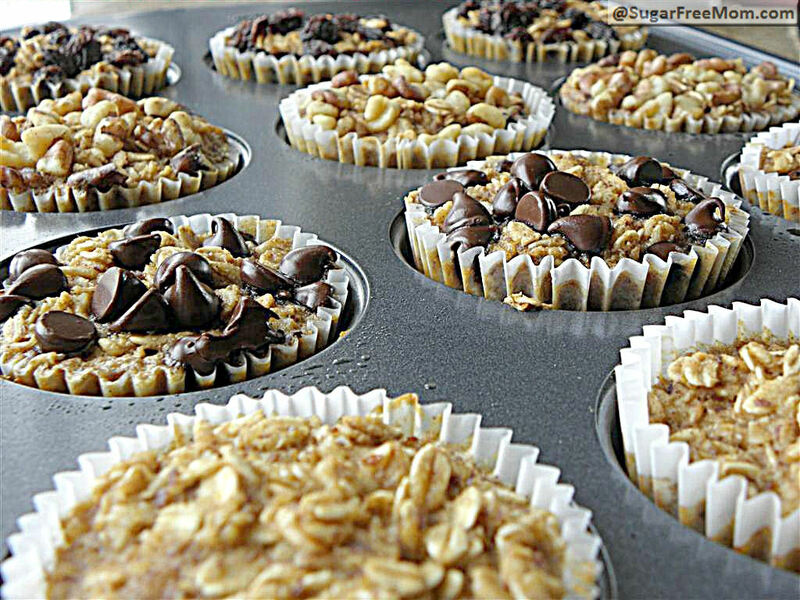 We make baked oatmeal all the time but I never thought of baking it in individual muffins. Thanks so much for sharing at allergy free wednesdays. Hope to see you again next week. This sounds great for moms who want to get their milk supply up too! I’ll be sharing this with my breastfeeding group! **Add 4 Tablespoons Brewer’s yeast if you’re making this for milk production. Jasmine – how many would you want to eat a day to amp up milk supply? We don’t use a microwave -other ideas for reheating? Thanks! You could reheat them by placing them in a preheated oven at 325 degrees, check at 5 minutes. You could even cut them in half and reheat then with a little butter in a saute pan. But that will increase calories. This looks great! I love that you put the WW points–the only thing is when I calculate using the recipe builder I get 6 points instead of 4. Did you calculate with the toppings? Mine are without toppings. I calculated w/o the toppings. I’ll just go with 4 pts–that works better anyway. Sometimes when you enter the ingredients into the recipe builder and calculate it that way it comes out higher. I will recalculate it again and let you know. I had made your originial indiv sized baked oatmeal “muffins” before and today tried this one (adding mini-choc chips) to the top. Both are DELICIOUS!!! Adding the chips to the top, I think, makes me use a lot fewer thank if I try to mix them into the batter, but the taste is definitely in every bite. (I do think I may try “pushing” them into the top of the muffins next time after sprinkling them on top and before baking. Maybe they won’t tend to fall off as easily when eating them.) Anyway…great recipes! Thanks for sharing. My husband (who isn’t really a lover of baked oatmeal) thought these were yummy, too. 🙂 I may try using “chocolate” or “vanilla creme” stevia drops next time instead of the powder to see what that does. Would love to be able to make a “chocolate” baked oatmeal in this way. 🙂 We’ll see. I’m still trying to figure out how much liquid stevia would be comparable to a teaspoon of sugar, etc. so it’ll be an experiment for sure. Again, thanks! I have a conversion chart listed for using stevia in this recipe. Thanks, Brenda. I see it now. That’s great! Love this idea. Not sure I have had baked oatmeal. Is the texture like a muffin? Yes more like a muffin. I have some in the oven right now and can’t wait to try them! Mine made 2 dozen and the muffin tins were full. Maybe because I used jumbo eggs? I just finished making these and they are great! I won approval from both of my kids and the hubby 🙂 Mine turned out a little gooey on the bottom, but the top half were fully cooked. Could this be the honey substitute or should I try and cook longer next time? Just curious how your muffin texture was…flaky or moist? Thanks again! Can’t wait to try more of your recipes! Try baking them a bit longer. I just made some Baked Oatmeal too! Love the idea of making individual portions with different toppings, that would be great for a big family breakfast or brunch! Great idea! If you freeze them, do you have any suggestions on how to re-heat them? Thaw them out the night before you want them and reheat for 45-60 sec. I am really forward to trying these. They look awesome! I’m going to use Stevia but was wondering if I could use maple syrup instead. Would I use a similar ratio as honey? I don’t use maple syrup, but I think that sounds about right. Just came out of the oven! Replaced eggs with eggbeaters, replaced apple sauce with a plain Greek yogurt and added fresh cranberries. This is a GREAT idea for all those different tastes.. I plan to try this recipe, sounds Delicious. Thank you for sharing. I don’t have an egg allergy, but I’m not fond of the taste of eggs. Can you taste the egg on this or is it just used like in any other baking recipes where you can’t taste it? Hi Maggie, all the other flavors are more dominant and I don’t think you will even notice the egg in there. Can I use steel cut oats? If so, is the amount & cooking time the same? I have not tried it but I am sure it would work fine. Great recipe. Made about 2 1/2 dozen. Wondering why they stick to the cupcake cups so much? Did I do something wrong? Did you spray the liners with cooking spray? It may still stick. Just made these today as part of a goal to become “gluten reduced”, not ready for gluten free yet 🙂 They were amazing!!! Thank you so much for the recipe! I followed this recipe to a T and it made exactly 36 muffins! That’s so strange! Anyway, they’re in the oven right now. I can’t wait to try them! I have a batch of these baking in the oven, and they smell wonderful! I also got almost twice as many cups as you. I did fill them up to the top of the cups. 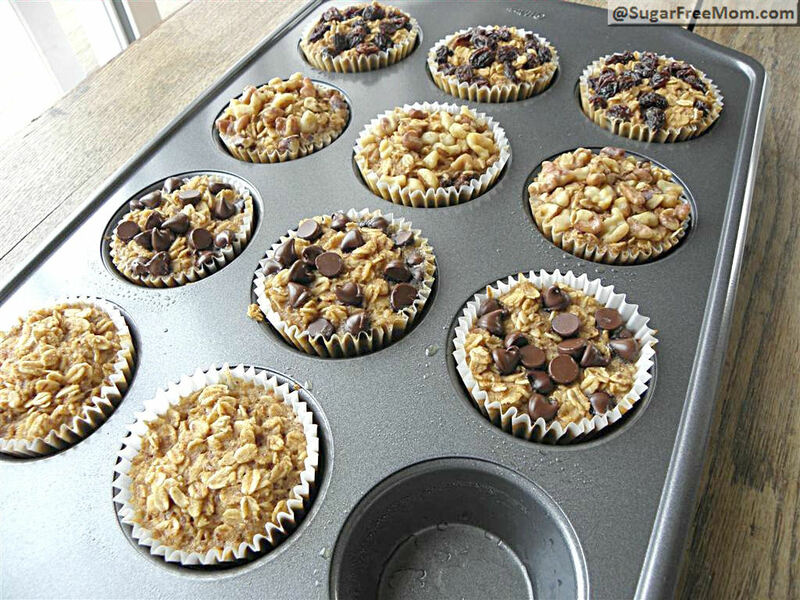 Do you use the large muffin pans or just regular? I’m trying to figure the calorie content, but I can’t figure out the discrepancy. Since so many have commented about the discrepancy and gettign many more than what I got I will remake the recipe this on Tuesday 3/6/12 and let everyone know. It may be my muffin tin is extra large and I will check that as well. Mine also made many more than 18. They are currently in the oven so excited to try them!!! As I started to make these, I opened up my applesauce and it was moldy 🙁 But- you can sub in 1/2 cup of brown rice flour if you don’t have applesauce and it works just fine! Can I replace stevia with agave? I am sure you can but I do not use agave so I don’t know how much you need. Mine turned out runny. Seemed like a lot of milk called for in recipe. It does look runny before baking but they come out very moist! I was thinking about adding in some protein powder to them. Have you tried that? If so, how much would you recommend? I don’t use protein powder, I’m sorry! Fun little tip, I blended spinach leaves and my almond milk before adding it. Just to throw in some extra nutrients. Although my muffins didn’t look as appetizing since they were greenish haha. My kids loved these!!!! Thank you so much brenda!! I am do glad I’ve found your website!!! I have used protein powder in some smoothies and o have some in my pantry but I often don’t use it. I have found some that are sweetened with stevia and some that are dairy free and some that are soy free but I have yet to find one I really like without a lot of additives. If you look at my adaption to this recipe, called Low Fat Personal Sized Baked Oatmeal I do use a scoop of protein powder in it. Thanks! did you try to protein powder? I’m not sure if this has been addressed or not but how long do you think they will keep if I didn’t freeze them? Thanks! I think they will be good for a week. I just made these and they are dee-lish! I used a cup of honey, as I didn’t have any stevia and you can’t tell there isn’t any sugar in them! Great just to eat on it’s own as a muffin or add milk to make it more of a porridge style oatmeal! Yummy! One more thing…I also added these up in the weight watchers online recipe builder and for 24 muffins, with honey, it was only 4 points+! That’s means I can have even more and stay within my points! Yay! I checked again using the ww recipe builder and without honey using stevia they are only 3!! So glad you liked them! Can’t wait to try these tomorrow! Maybe the difference in qty is due to the type of oats….old fashioned vs quick. I used the quick oats one time in a cookie recipe and the dough was way different than usual — cookies just melted while cooking and not firm & holding their shape. ???? I just made these and they turned out great. I got 24 “muffins” by filling to the top. Each one took 1/4 cup of batter. I added chopped apples to mine and omitted the stevia. I used a really ripe banana because I thought they’d be great for a quick breakfast for the kids but don’t like to give any unnecessary sugar. Thanks. Ok!!! I remade these this morning and got the same results exactly 18!!! I used the same ingredients as described above and this time I added some honey instead of stevia to check the batter. Runny batter means nothing because they are super moist. Nope no error. I retested it this morning. I did use five cups of oats and everything else in the recipe. I actually even used 1/2 cup of honey instead of stevia today. I had HEAPING 1/4 cups going into each muffin as well as about a half a cup left over where I topped off some that looked smaller than others. I could have made 20 muffins. That’s so weird…I wonder if it’s something crazy like the size of the oats or something like that. Whatever the case, thanks for the great recipe! Mine are in the oven right now and I can’t wait to try them! This is my first time making them. I have been reading the comments and I noticed a lot of people made a lot. Well I made 20 but could have just made the 18. I wanted to have the extra muffins than just making the 18. My muffin pans are standard. I filled mine to the rim of the liner and a little extra heaping. That’s what it looked like on your photo, so that’s what I done. Thanks for the recipe. If it taste as good as it looks and smells, it’s going to be AWESOME!!!! Thank you for sharing! I appreciate knowing I am not losing my mind and someone else got the same amount as me, I’ve made it a bunch of times since and still get the same amount, thank you! OK, for what it is worth, here’s my two cents about the number of muffins you end up with. If folks are adding fruits or other items to the batter itself, they’ll get more batter quantity and end up with more muffins. If they are only adding the items as toppings after pouring 1/4 cup batter for each muffin, they’ll have less muffins. I made these (without the flaxseed because I didn’t have it) and they were delicious! Thank you for the recipe! Next time I think I will mix in the toppings a bit (but sprinkle some on so that we will know which is which). But they were really, really good. Is there a printable of this? Am I blind? I have no idea what happened but I am trying to fix the printer problem asap. It is fixed now, thanks for your patience. I think you could just eliminate the flaxseed and it would be fine. I would not use the oil. Thanks! I am very excited to try this but I have a few concerns. My daughter is on a restricted diet and there are a few changes I would need to make. I can replace apples with banana but will it work to skip the paper cups and use vegetable oil to grease the muffin cups. We can’t use the spray because of the preservatives, I am concerned this will become a stuck on mess? I am sure that would work fine. I have tried them without paper cups and them came right out. The reason I use the cups is because I often like to freeze some, but you can still certainly freeze them in a plastic container then thaw overnight and they shouldn’t stick together at all. I also got 33 muffins–they’re in the oven now. I substituted the 1 cup of honey for the stevia packets, so I assumed that was where the extra volume was coming from. Also, substituted soy milk for regular milk, and I used 4 c of GF oats, +1 cup of Quinoa flakes (just because I was running out of oats!) and I want to try a Quinoa flake version of this later, for a friend who reacts to all oats. Ok, the 33 muffins are out, and they are delicious. 🙂 However, they’re not very dense, and have a loose, moist, easily-separatable texture. Since you repeated your recipe and got 18 muffins again (and you only used a 1/4 cup scoop? I used 1/3rd cup and still got 33.) I wanted to ask about the milk content. Sometimes, when I’ve done recipe swaps, the method of measuring was what threw people off, so I wondered, did you use stacking measuring cups for your 2 3/4 cups of milk, instead of a pyrex-type liquid measure? Seriously, these are awesome muffins, and if I can trouble-shoot the problem to get your results, I’ll make them once a week. Thanks so much! I did use a stacking measuring cup and not a pyrex glass cup to measure the milk. Yay!!! That’s it!! A pyrex cup measurement of 2 3/4 cups means you’re putting 22 fluid oz of milk in the batter, while a stacking cup of the same “cups” amount gives 18 oz. I know it’s only 4 oz difference, but using the cup of honey instead of the stevia, plus the extra milk, will give a significant increase in the volume of batter. YES! I can’t wait to make these again. Thanks. Well I am super glad YOU figured it out because that was bothering me. Next time I make it I will use my pyrex glass measuring cup and see if I get more than 18. Thank you! I have never seen so many people complain/disagree/question in my life! I could never blog! These look absolutely delish and what a great idea!! Thanks for the awesome recipe!! LOL Jessica! I don’t mind it 🙂 Thank you! I have to agree! I think you must be a saint, Brenda! Looks like a delicious recipe! I’m definitely gonna try them! Yeah i forgot to spray the liner with the cooking spray, that would have made a big difference! I also just used 2 cups of milk and it makes them a great consistance with no flax or banana. Instead i added chocolate chips and craisins. Just popped these in the oven and then noticed I forgot the milk!!!! I am not known as a good cook, but I keep trying. I am going to watch these closely. Maybe they will turn out, but not need as much time in the oven… Here’s hoping. They look soooo good. I made these tonight and they were fantastic! I substituted 3/4 cup of grade B maple syrup for the setvia and on a lark, I separated half the batter and added one tbsp of unsweetened cocoa powder to it. It gave the muffins a nice chocolately flavor without adding any sugar 🙂 I might try adding a little more next time and see if I can get a more decadent chocolate treat. These look so good! About how many calories are in one? Never mind. I just saw. Sorry! Could I substitute something else for bananas? I really hate them. What do you recommend? Some have said they might try pumpkin, but of course the sweetness is not the same as banana so increase your sweetener. I want to make these for a beach trip with friends! I have never worked with Stevia but I have Splenda packets. Can I use those as a substitution? And how many packets would suffice? Thank you, looks yummy! I don’t use splenda because it is artificial. But I know its equal to measuring with sugar and I recommended trying 1/2 cup to 1 cup of honey so maybe start with 1/2 cup splenda. I too am going to try these with Splenda. I personally hate Stevia…. Yes, it is all natural, but it is bitter like Saccharin. I just can’t get over that. Everything I have ever eaten with Stevia in it has a bitter after taste. Anyone else experience this? I personally use the sweetleaf brand BECAUSE there is NO aftertaste. Hi, I just made these today (have been looking at them on my Pinterest for a couple of years, lol, but finally got around to making them.) They are currently in the oven, so I will have to update with how they turned out. I do not like Stevia, either, and while I have honey, I decided to use the same amount of Agave Nectar. I also used the amount of everything else listed and I was able to get 27 muffins! I am excited and hope they turn out well b/c I’m a nurse and I’m always leaving too early in the morning for a decent breakfast, so I’m hoping this will be the answer! If I were to freeze them, how long do I need to reheat in the microwave? Or should I just take a couple out the night before to thaw in the fridge? Thanks for this great recipe! Can you use water instead of milk? I haven’t tried it so I can’t comment on taste. Other milk alternatives like coconut milk, soy or almond would probably work. I made these twice. The first time using 2 3/4 milk plus 3/4 cup honey and 1/3 cup loose brown sugar. Way too much; I ended up getting about 32-33 using a 1/4 dry scoop in each muffin tin. They weren’t the right consistency so I ended up having to cook them quite a bit longer (10 mins?) to get the moisture out and ended up burning the bottoms a bit. But they were so good I decided to make them again- which is when I noticed the comment about liquid vs. the dry measures that were used. AHA! They were amazing. My husband hates oatmeal and loved them. My four children ages 1-10 and I love them as well. Dairy free, gluten free, and delish! Thank you for the awesome idea and recipe! Thank you for sticking with it and making great substitutions that work for you and your family and for sharing what you did! I just made these this morining! I left some stuff out because i just didn’t have it or beacuse they are not things i keep in my house hold like the flaxseed meal. i didnt have a banana but wish i would have. i used the honey instead of sweetleaf stevia. I topped with brown sugar and used whole grain oats. They were WONDERFUL!!!! my 3 year old who all of the sudden doesn’t like anything anymore love them!. he had two and so did my 19 month old. I love that they can have oats without all of the mess of making oatmeal on the stove. I also love the fact that i can freeze the extra that i make and just reheat. These will also be great where we travel alot. a good snack/meal to take along. Thank you. I added some small cut up apple to the mix. Yummy! These are fantastic!! I also liked the chocolate cups on top. I also tried nutella, which next time I do that I will fill the cups 1/2 full, put in a little dollop of the nutella and fill up the rest if the remaining cup. Yummy! I also used truvia, and since I didn’t have flax seed meal I replaced it with 1/8th (2tbsps) cup of veg. oil. Great idea! Thank you! I’m so eager, to try these but I’m allergic to *apples* and thus applesauce. Can I use canola oil? You might try it, but since I haven’t I can’t vouch on taste as the applesauce also adds natural sweetness. I didn’t have apple sauce nor pumpkin but I did have one banana, I scoured my cupboards and found a can of whole berry cranberry sauce and used it instead of applesauce. Turned out really good! Thank you for the wonderful recipe! Try other fruit purees – I LOVE peach sauce and I bet it would make a tasty peaches and cream oatmeal muffin! Just made these tonight. They were great! Unfortunately DH thought so too, which means they will be gone in no time. We’ll see what the 3 year old thinks, he was asleep by the time they were done. I topped with dried apples, dried bananas and cinnamon chips. The dried fruit burned a little but I just pulled those pcs off. Will definitely do it again. My plan is to take one for breakfast each morning. I made these this weekend with 3/4 cup light brown sugar instead of stevia (because I had all other ingredients on hand). I also used gluten free oats and almond milk. I was able to get 24 oatmeal “muffins” from the recipe. They are great. My 2 yr old and I are devouring them. 😉 Great recipe!! Thanks for sharing this recipe! It is our new favorite! We add the above toppings – as well as sprinkling with hemp hearts for a yummy nutty flavor.Another one the kids are loving is chopped up dates mixed in. Wonderful!!! Made these this weekend. My 18 month old and I are loving them! I’m already planning to make another batch using blueberries. I did forget to spray the cupcake liners and it did cause the baked oatmeal to stick some 🙁 Not too bad, but definitely dont skip that step! This is brilliant! I can’t wait to try it! I pinned it too–let me know if that’s a problem! Are you kidding?LOL LOVED that you pinned it! Super yummy! I think next time I won’t use paper liners (which may be why I had 24 muffins, the liners are smaller than the pan & therefore hold less batter). The family all like them too, which is hard to accomplish! Do you think there is a way I could add protein powder to these in some way? I am horrible with conversions and such. I can only follow exact recipes. I know it’s pitiful… Thanks so much for your help in advance! I can’t wait to try these! I am sure you could add it but since I do not sure protein powder I would be guessing on amounts for you. SO sorry! Though I don’t have a family I need to worry about pleasing, these look great for a busy single gal like me who likes to keep healthy ready-to reheat items on hand for mornings I need to get out the door on time. I’ll definitely have to give these a try! I agree! Single gal shout out! LOVED this recipe! Found you via Pinterest and this is definitely going to be one of our families new favorites! They make a great snack or breakfast & were such a healthy yet delicious food! I JUST made these, and mine actually came out to 26 instead of 18! I followed the recipe to a T, except that I added 2 more (small) bananas. Could that have made eight more muffins?! For my toppings, I used a half a cup of fresh blueberries on 6, a half a cup of chopped pecans on 6, a half a cup of raisins on 6, 1/4 cup of chocolate chips on 3, and a few sliced fresh strawberries on the last ones. Entering all of that into the recipe builder (plus the extra two bananas), I’m getting 3 points, which is great! Can’t wait to try them! They’re cooling now! Thanks for the recipe! I don’t have a banana (and really don’t care for them anyway) will it be the same without, or is there something else??? I read through the comments and didn’t see one like this…sorry if it’s a repeat! No Problem Cara, I add the banana for moistness and natural sweetness. You really cannot even taste the banana in there. Some have mentioned trying it with pumpkin instead. I wouldn’t recommend leaving it out, but subbing in something else. These are great! I’ve never used stevia but I used 1/4 c honey, and they taste great. My 2 year old helped mix and measure, and loved adding the toppings! I’m excited to make them again and experiment with other toppings. I think these will become a staple in our house! Thanks Brenda for such a detailed recipe, and for being so responsive to your commenters. I’ve pinned it, and plan to try it out soon. Will report back on my results. I don’t have flaxseed meal, do u think I could sub psyllium husks in its place or do u have another substitute suggestion? I might try it with the slightest bit of honey but I don’t like stuff too sweet, so hopefully will be good I don’t have stevia. You can eliminate the flaxseed without problem. These are barely sweet even with 1/2 cup of honey. what is the measurement for honey?? it’s up to you, 1/2 cup is good enough for me but may not be sweet enough for you. Made these for my PICKY 2 year old triplets and they love them!! I used just a half cup of honey and I added in 2 table spoon flax seeds since I had no flax meal. I also got 36 muffins! Thy are amazing!!! Thanks so much I will be making them every 2 weeks!!! Got married last Saturday, and I wanted to do brunch with our families the next morning. Didn’t want to try to do a restaurant with the number of people and small children, so we went the DIY option (we were staying in a beautiful mountain house, so that was also a more comfortable option then going out to eat). BUT of course, having the wedding the day before, I was looking for recipes that could be prepared in advance and would be EASY. This sounded perfect–and it was! Made them the weekend before and froze them. That morning, after I baked something else in the oven, I turned it off then put the thawed cups in the still-warm oven for a few minutes. Warmed them nicely without re-cooking them. I get migraines from some sweeteners (not been brave enough to try Stevia), as does my mom, so I used real sugar (I didn’t see the honey substitution at the time), but only a couple tablespoons (I thought Stevia was a one-to-one conversion, like Splenda). Even with that small amount of sugar, these tasted fantastic! Everyone–kids and adults–loved them and I had lots of requests for the recipe. I mixed in white chocolate chips and chopped walnuts in half and raisins and walnuts in the other half. I am honored you used my recipe for your wedding! How cool! So awesome everyone loved it! FINALLY!! A way for me to eat oatmeal. I hate regular oatmeal, so this looks like a perfect alternative! Cant wait to try them out!! Found these today on Pinterest and made them tonight, they turned out great, the recipe made exactly 18 and I can see how this is a great base to become very creative with many options. This will be a big help on busy mornings, thanks! Hi. Where do I find Flax Meal? And is it 3 weight watchers point per oatmeal cup? I have found it in the healthy food sections of my local market, Whole foods,and also at Target. You can also use flax seeds and grind them yourself in a coffee grinder. Yes, 3 points without toppings. I made these tonight. The muffins are pretty mushy from the middle down. The bottoms are wet. The toothpicks came out fine when I checked them. I am not sure what I did wrong. Any suggestions? I followed the recipe except I omitted the flaxseed because I didn’t have any. Love this idea! Can’t wait to try them again! I don’t think eliminating the flaxseed would make them that mushy. Sounds like you just may need to cook them longer. Also how many did you get in your batch and did you make any other substitutions? I got like 30 of them. We ate them this morning and they were great! The kids loved them. I think it helped that they sat in the fridge overnight. They were not as mushy this morning. I put some brown sugar over some and whipped cream on the top of a couple others (to make it more fun since it is my son’s birthday). I might try and cook them a bit longer next time. Thanks for the great idea! Wow they are amazing…you were right…even the fussy ones like it. Thank you so much for these recipes. I made the rice tortilla chicken for dinner then had one of these with coffee for dessert and I think my husband will be having a few for brekkyas well. Job well done. Wow…I see why there’s so many comments. Can hardly wait to make these. I’m diabetic & oatmeal raisin cookies are my favorite. I can hardly wait! These look so good! I wanted to make them when I found the recipe last night but I am out of applesauce, so looks like this afternoon I’ll be headed to the grocery! I am also on WW, and calculated this with the recipe builder. I put 1/2 c. brown sugar in place of the stevia (because it’s pretty expensive around here to use for baking), and omitted the flaxseed because it’s hard to find around here. It still comes out to 4 PP per serving. Just an FYI! Thanks for the recipe, I can not wait to make these tonight and eat them for breakfast and pre-workout snacks!! Love these! My husband and son like them too. My husband eats them as dessert. I popped them in the freezer and just put one in the microwave first thing in the AM. I just made these. Because I did not have a banana or the flax, I substituted Fage Greek yogurt for moistness and protein. They turned out great! I used Stevia in the Raw, which measures cup for cup like sugar, so I put 2/3 cup in it. By the way, I found this on Pinterest, and thanks so much for the recipe and all the responses! These are absolutely delicious! I topped some with blueberries and others with ultra dark chocolate chips…next time I’m skipping the fruit and going all chocolate…and I’ll mix it in instead of using as a topping so I can get that chocolate taste with every bite. Thanks for these…they’re amazing! Just want to double check and make sure I’m thinking right… Is the weight watcher points+ for one “muffin”? THANKS!!! I’m really excited to try these!! Sorry, I finally got down to comments that answered my question. Thanks!! yes someone has tried that and said it worked just fine. OMG! If you try to print this recipe, make sure you copy and paste it into Word or Notepad! My printer is in another room and I didn’t notice until after it had printed 15 pages of COMMENTS! And no recipe. It should be printer friendly. You should be able to eliminate pics and comments. I also got the pics and all. I pressed the printer friendly button, and then the printer icon you get. Just thought I’d let you know! Thanks! But I believe you have manually delete what you don’t want printed before you click the icon. Let me know tho if that is what you did, thanks! I just wanted to thank you for this recipe! I made a double batch of these and froze over half. I am a diabetic and I am financially conscious. This recipe meets both of my needs. Not to mention that my husband and son love these as well. It has replaced my pre-made granola bar habit of which we both know are not as healthy an option. Thank you do much for posting this!!! My oldest will be starting kindergarten this coming school year and as a very busy Army family these will be fantastic for breakfast!! I just have one question… My youngest has dairy and cinnamon allergies. I read on an earlyer comment that I can sub cows milk for other but do I have to use cinnamon?? Welcome! The cinnamon is simply for flavor as I love it, but you can eliminate without problems. I too was wondering about the cinnamon because I have made banana-chocolate chip muffins with no cinnamon before and love them. These are great and taste similar, but I think they would taste more like a banana muffin (but healthier!) without the cinnamon. Do you think I could sub another banana for some of the applesauce? Thank you so much for the recipe and for answering everyone’s questions! So, chances are my comment will get lost and not be noticed, but this is an issue for some. Great recipe! I just tried it out and used some different toppings:) As a busy grad student I love that I can just grab this and go! I’ve not heard about coach’s oats and have not tried steel cut yet in this recipe. You can use liquid stevia. One packet is equal to about 8 drops. I work an early shift at my job, and several people enjoy Oatmeal daily. I am baking these right now to take and share tomorrow. I followed your receipe exactly, with standard measuring cups, and got exactly 18 🙂 I topped mine with raisons, choc chips and some with brown sugar. I also subbed honey for Stevia, and omitted the banana altogether. I can hardly wait to try them ! I can see this easily being a reg staple to have in my freezer. I made these with strawberries, blueberries and a little brown sugar…amazing! I am making these now! I accidentally bought regular applesauce (oops!) Do you by any chance know how much that would change the nutritional information or know how I can figure that out? I read about the weight watchers builder but have never used it before! Thanks for the recipe… I am looking forward to taste testing them!!! Hi there! I LOVE this idea! My kids take a snack everyday to school and I’m tired of giving them store bought granola bars. This may be a silly question, but what do you think is the best way to store them if they are going to go into a backpack in the morning and be eaten mid-morning? Just in an airtight container or in the fridge overnight? Thanks again for the awesome recipe! I would definitely keep them in the fridge overnight in an airtight container. They should be fine in the backpack like that. Could also use sweet potatoes instead of bananas or pumpkin. Yeah! Good to know you got around the same as me! Glad they liked it! Does anyone know what the differences would be if I used Quinoa, instead? I am so trying these! This would be great as I’m rushing out the door to work! My husband was just diagnosed as diabetic, and I am frantically looking for things he can eat. I was told he needs to watch his carbs. These seem to have a lot. Are there different kinds of carbs or something that make these okay for him to eat? I just baked these and replaced one cup of oats with 1 cup of almond meal, which has lower carbs. They turned out great! Thank you so much for putting the WW Points Plus value on this recipe. That is extremely helpful. I am making these right now for my bible study ladies. I think that they are going to be a hit. Do you have to add the flaxseed meal or is it just to make it healthier? Thanks. YOu can eliminate it and it will still be good. I love Maple and brown sugar oatmeal. Any thoughts as to how to get that flavor into a muffin? I know you can use the brown sugar as a sweetener but how about some maple syrup? Would that make it too runny? If you use maple syrup in place of the honey I suggested if you are not using stevia. I wouldn’t use more than a 1/2 cup though since its consistency is more runny than honey. I don’t think of it as a muffin because the texture is not the same. I take mine out of the liner, in a bowl and pour a little cream over the top. I’ve also taken it right out of the fridge and eaten it cold. Whichever your preference. I made them to be portion controlled because I was finding my original recipe for a large baked oatmeal in a 9 by 13 was inviting me to just eat way too much. Made like these and I don’t overeat. I can’t believe, out of all these comments, no one has picked up on what I noticed immediately while reading your post (and again in a reply you made to a comment). Unless I’m having a really blonde moment, you say you made 4 each of 4 different kinds of muffins, in a 12-capacity muffin tin. But 4×4 is 16, and in the photos it looks like you only have 3 of each kind. I know it’s a bit nitpicky, but in light if all the comments regarding how many muffins the recipe makes, it got me curious just how many you DID end up with. Hi Sharon, actually a previous commenter questioned how many I made since the pics don’t show the 18. I will share again since it would be difficult to find within all the comments. The additional 6 you don’t see were eaten by the hubby and children and were blueberries and chocolate chips. I have made the recipe 5 or 6 times since and stand firm on my amounts and ingredients. I still get between 18-20 depending on how much I fill the cucpcake liners. I just saw that you already answered that. Never mind -thanks! I have to be honest – I thought these looked tasty, then I read the recipe and thought, “This is TOO healthy for me,” but I have been on the search for a quick and easy breakfast that is healthy too, so I thought I would give it a try. I don’t do stevia, so I subbed 1/4 c. honey and 1/4 c. brown sugar. While I plan on adding 1/2 c. brown sugar and no honey next time, these are AWESOME. Seriously amazing. Even my dad, who is a sweet-a-holic, and my mom, who is averse to any “healthy” food, each ate one. Mom did ask for more brown sugar next time, but both gave the muffins two thumbs up. Thanks for the excellent recipe! One note – if anyone adds dried fruit (raisins, apples, etc.) you might want to mix them in – ours got a little browned during baking. My favorite topping is a little extra cinnamon and brown sugar. Yum! My daughter loves anything oatmeal but is allergic to bananas! :(. Will it turn out right if I leave the banana out?? I think its in a previous comment that someone suggested using pumpkin. You might want to increase sweetener of choice though as the banana adds sweetness that pumpkin doesn’t have. this may be a really stupid question, but is a muffin tin the same thing as the cheap dollar store cupcake pans? that and the liners are the only things im missing to make this for breakfast! You can bake it in a large 9 by 13 baking dish and then cut them up into servings that way. Yes you could use cupcake pans and don’t necessarily need liners but ti helps to freeze them easier. Try hemp seeds in place of the flax. They’re full of protein and have a nice nutty taste that goes really well with oatmeal. What about replacing the flax with almond meal? I’m not sure, my boys are allergic to nuts so I can’t use it. I replaced the flax with almond meal, same amount. I’ve made three batches now and they are GREAT! I am 14 years old and I will be making these either tonight or tomorrow night for my family and I. I’ve been looking for a good oatmeal muffin recipe for a while now because we have a huge box of oatmeal in the pantry. I think I just found the perfect recipe. Can’t wait to try it! I’m so glad you found my recipe and I look forward to hearing how your family likes it! Made these this morning (mine made 24). They were a hit. We have eaten 10 of them today. My girls are eating them up. So healthy, I did use honey instead of stevia. It is also a great breakfast for me since I have gestational diabetes. I was able to freeze a few, I did it before they ate them all. I am 14 years old and have just made these muffins for my family. We too can not decide on one kind, or no topping, for anything. I decided cut the recipe in half and actually got 12 muffins instead of 9… oh well! Thank you so much for sharing your recipe. I can’t wait to tell my dad that the yummy muffin he’s eating is actually healthy! I was just wondering if anyone has tried these with pure maple syrup. I have all the ingredients but the stevia, so I thought I would sub 1/2 honey and 1/2 pure maple syrup. This recipe looks delish! I think someone did use maple syrup and said it was very mushy and too loose to hold together, so if you use it only use 1/2 cup and forgo the honey. I’m happy that for the most part,people love the recipe and are enjoying it like my family is. I wanted to help other families with picky kids like mine and moms like me watching their weight who wanted to eat what the kids were eating and not have to make another breakfast or skip it altogether! Thank you! Can you taste the banana? Is it necessary? My hubby hates banana anything. I personally don’t think you can taste it because of the cinnamon, applesauce and oats but some people have subbed the banana for pumpkin. I haven’t but since banana is naturally sweet and pumpkin is not you might need to increase the sweetener you use. I also hate anything banana, but am a HUGE fan of these muffins!! The only time I tasted the banana was when I used one that was on the larger side. I have since learned and stay with medium sized ones. I thought you were not supposed to cool flax meal as it becomes toxic? Anybody know any different? Sorry I meant “cook” not cool. I’ve read over about 4 different articles and none talk about precautions or warnings cooking with flaxseed, all promote using it in cooking and baking. Ouch! I’ve not heard about that at all, scary! I will have to investigate! Oh my goodness. I found this on Pinterest, and as a post-bariatric surgery foodie, I am always looking for interesting recipes that work with my eating. I thought – wow, this looks good, I bet I can make it work for me. So some slight changes for my diet: I used 1 3/4 cup milk, and 1 cup water mixed with 2 scoops vanilla whey protein powder (the bariatric mantra is “protein first). I skipped the flax meal. I also didn’t add the banana, but mixed everything else up, then separated it into 3 bowls. In one, I put in the banana and a cup of walnuts (banana nut bread), in the second, I put in 1 grated zucchini, 1/2 teaspoon ground nutmeg (fresh) and a cup of walnuts (zucchini nut bread), and in the third I put in grated carrot. 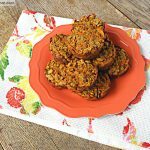 Then I divided them into 24 muffin tins (the carrot and zucchini increased the volume), and baked for about 30 – 35 minutes. They came out AMAZING! And they are 173 Calories; 8g Fat (40.7% calories from fat); 9g Protein; 18g Carbohydrate; 3g Dietary Fiber; 22mg Cholesterol each. (Plugged them into Master Cook). Great high protein and healthy way to start a day! Thanks for sharing these. This recipe looks delicious and I can’t wait to try it! I’d like to pin your recipe on Pinterest and I would like to give you the credit for the recipe. Is it ok if I pin it and put “recipe by Brenda, found at https://www.sugarfreemom.com“? yes thank you very much! Love that these caught fire and were all over pinterest. Tried them just as the original recipe was and they are awesome! Made 24 muffins, so I am extra happy b.c they will go like hotcakes! My picky one hates oatmeal too!! And its been amazing on Pinterest, I’m so excited about the response!thank you! I am so excited… making these as I’m typing and they smell great!! I was wondering if it would work to replace the banana with sweet potato… Has anyone tried that? no one has tried sweet potato, only pumpkin to replace the banana. Give it a go and let me know! How about using steel cut oats instead of regular? Any ideas on how to tweak the recipe to make that work? I’m making them now for a fundraiser. They look soooo good and smell wonderful. I sprayed the muffin cups. (: I make 12 with nuts and 12 with chocolate chip. I used the extra batter in a small dish with both nuts and choc. chips. Thanks for sharing! Did I miss how long you should bake them? This sounds amazing and I want to try it soon, but was wondering if anyone had any ideas how to tweak it if I wanted to use steel cut oats instead of old-fashioned rolled oats. Suggestions?? I love these!! They are so good I eat one as a snack without milk, like a cupcake 😉 I just bought steel oats and have them sitting over night to make and bake in the morning. I’m not sure how they will turn out as I wasn’t sure about the conversion. My husband is not an oatmeal eater but tired it because I put chocolate chips on a few to tempt him 😉 thanks for the recipe, I have tryed Splenda, nuts, raisins and blueberrys, plan to try apples next time. Not all at the same time though. Be ready tomorrow April 20th for all you steel cut oat lovers! My adult daughter and I have a very “grab and go” schedule in the mornings and these muffins were the perfect answer!!! I have been making them for the past month and now we can’t function without them! I add raisins and apples or blueberries as well as almonds (to add a little more protein). They are the perfect breakfast (along with a hard boiled egg) for our crazy morning routines. Thanks for sharing!! The kitchen smells GREAT every Sunday evening as well!! This recipe is amazing! So delicious!! I’m trying to be more intentional abut eating breakfast and sitting down for breakfast doesn’t happen, no matter how hard I try, so something I can eat in the car and make-ahead is perfect! I’m excited to try all the recipe combos I brainstormed while cooking & reading comments! Do you have to use banana? It adds sweetness and moistness. You can’t taste the banana at all. But some who are allergic have tried using pumpkin instead. Oh thank you. Banana was the only thing I didn’t have. I do however have pumpkin and that might taste good. found this on pinterest and made them tonight. so good! i changed it only in that i didn’t add eggs (allergic), and then added peanut butter to the batter. also used a lot more flax meal, maybe a whole cup (on accident!) and it still worked out perfectly. husband loves them and is already requesting other flavors– blueberry with walnut, apple cinnamon, maple and brown sugar… looking forward to trying the pumpkin that other people mentioned! Thanks for the recipe i did half plain and half with the Trader Joe’s Choc Almond and Walnut Trek mix chopped on top. It made 24, i think bc i used skim milk which seems runnier! These were great! I replaced the Stevia with 1/4 cup Splenda and added 1/4 cup Brown sugar. I ended up with 27 muffins (1/4 cup scoop each). Counting calories (minus toppings) each muffin is 101 calories. Perfect snack! Can I repost (giving you credit, of course) to my blog? Thank you for asking. You can post the recipe with a different name, your own pictures and sharing the changes you made. If you have made no other changes other than simply the sugar I would ask that you not include my directions or ingredients in your post and only include a link back directly to my recipe. Thank you. Thanks Brenda for this recipe. Just made my first batch and this will not be my last batch for sure. I didn’t have bananas so worked fine without them. I had some applesauce with sugar I wanted to use up so did and cut back the other sweetner to about 1/4 cup of honey. Again, was trying to clean up a few different types of oatmeal so all they went in just fine:) For my toppings did one of these varieties on a couple for my “sample” batch: chocolate chips (of course), butterscotch chips, walnuts, new Plum-azins and put some blueberries in the last few. I just sampled the walnut one…yummy and not too sweet! I did use the Vietnameze cinnamon I got from Penzeys so extra special flavor! Coming from a generation that grew up without microwaves, here is a suggestion for reheating in the oven without drying out rolls or in this case muffins. Place the muffins in a brown paper bag and roll the end to seal the bag. Run the bag with the muffins in it under the water faucet until the bag is wet but not soggy. Place the bag in the oven at about 350 degrees for a few minutes until the bag is mostly dry and the muffins are warm. The water on the bag helps ‘steam’ the muffins or rolls and allows them to warm up without drying out. Fabulous! Thanks for the tip! Do you think I can omit the flaxseed meal or will it totally kill the recipe?? Yes you can omit without problem. how long are they good for in the freezer? I’ve never had them last very long we always eat them pretty quick, but I think they would be fine for up to a month in the freezer if wrapped well or in an airtight container. How do you store these aside from freezing them or is freezing the best way to go after theyve cooled? How long are they good for out of the freezer? I’ve kept them refrigerated for up to a week without problem. Can I substitue greek yogurt for the applesauce? I haven’t tried it, I think it could work. But if using plain and no added sweeteners you may need to increase your sweetener as the applesauce is naturally sweet. Ooo, these look so yummy and very interesting! I think I may try a few for the family! Found this post through pinterest! Many blessings! Apparently if you soak oats, they are way more nutritious for you! I tried it with this and they look pretty good (more like muffins). we’ll see how it tastes! Thanks for the great recipe Brenda, my first batch are in the oven now, and fingers crossed because I am not certain I used the right kind of oatmeal, making them in Australia I’ve had to make some very minor adjustment. Waiting another 20 minutes for results!! turned out mushy, not cooked through and not the right consistency, didn’t rise; but the flavours were there, the taste was spot on. Am going out in the morning for the right oats!!! should I beat the eggs (mine weren’t very large this time around either) ? I have a fan forced oven (cooks faster) here (in australia) but am using without the fan at about 175 Celsius. I am using silicone muffin trays, would this cause my problem? Im using 1/2 c honey, not using any gluten free ingredients. Other than that, i’m following exactly. Thanks again Brenda!! HI Amber, I don’t think the silicone muffin tray will make a difference. Using honey is fine. Just to let you know they really aren’t supposed to rise much and they not the consistency of a dry muffin. Are you using instant oats or rolled oats? You could cut back by a 1/2 cup applesauce or try my steel cut oat recipe instead. 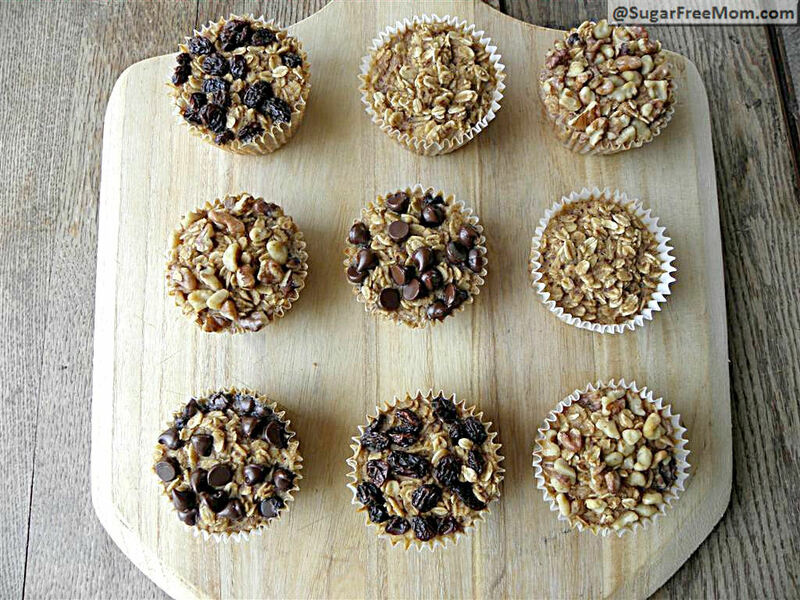 https://www.sugarfreemom.com/recipes/personalized-baked-steel-cut-oat-cups-no-added-sugar/ Hope that helps! Mine were in over 45 minutes and they still came out mushy. I cut the recipe in half because I did not need 16 of them, but I still had close to 16 by cutting it in half. Why didn’t mine cook? What ingredient did you use for sweetener? What type of oats, rolled, quick or steel? MIne came out mushy too! I think I used too much non-stick spray. I cooked mine longer than 30 minutes and they were still mushy 🙁 The flavor is delicious though. They are not supposed to replicate a muffin.They are supposed to be quite moist, but you could just decrease the amount of milk by a 1/2 cup next time. I used honey instead of stevia, and used almond milk, and GF oats from trader joes. As another commenter said, oats are NOT gluten free unless specified clearly on the label. And this recipe makes way more than 18! You must have giant muffin tins. I made 30 normal size muffins from your ingredient list. We make lots of baked oatmeal on a weekly basis and our standard recipe to serve 4 people is 1 1/2 cups GF oats, so I knew 5 cups of gf oats would make far more than 18 muffins. No mine IS a standard muffin tin and I still get 18 EVERY time I make this recipe and I have made it more times than I can count. I made this recipe exactly and double and triple checked the ingredients, and I have 24 standard sized muffins in the oven right now and still enough batter for at least 8 more. I’m crossing my fingers that I didn’t do something wrong if I ended up with so much more batter! Thank You for posting this recipe on Pinterest. Made them tonight. Delicious! I used 2 T. honey & 2 T. blackstrap Molasses for the sweetener and they turned out great! These were wonderful. I love that I can make different flavors because of the individual cups. I used organic granola raisin cereal instead of granola and left out the applesauce & flax (because I didn’t have either thing on hand at the time). I put strawberries in some and chocolate chips in them all. I will definately do this recipe again. GREAT idea. Thank you. Now we can have granola bars without buying 15 different flavors. I just came upon your blog via Pinterest and these look wonderful! I’ll be making them. I made these tonight for breakfast tomorrow and throughout the week. I am so excited to try them!! I was pretty worried at how runny it started out as but because of your comment about it being runny I pushed forward and they seemed to turn out great! They are cooling now!!! My daughter who doesnt even like oatmeal is excited to try these! Thank you!! So yummy! I used chia seeds instead of flax, a little extra applesauce because I didn’t have bananas, and 1/2 c honey. Topped some with choc chips, and the rest mixed in chopped almonds and dried apricot pieces. I got 24 very full muffins. Kids and I are devouring them warm. Thanks for the versatile recipe. How long will these stay good in the freezer? at least up to a month, never had them even last that long but I think they would be fine if not even a bit longer if packaged well in an airtight container. Hi!!! I have NEVER commented on a blog before so here goes!!! These look AWESOME!!! My kids LOVE oatmeal (or porridge, as we call it over here in sunny Scotland!!) but my oldest son (5) takes a really long time to wake up properly in the morning so it’s often difficult to get him to eat anything!!! When I showed him this recipe his eyes lit up and he said ‘It’s like getting cake for breakfast! !’ I’m going to make them today with raisins as both my boys love them!! Thanks so much for this recipe, we’re trying to bring them up as healthy as they can be but I would never have even thought of this!! That is awesome! How cute is your 5 year old! Cake for breakfast is pretty accurate! Thanks for sharing! Thank you so much for sharing and I admire your health consciousness. I just checked it out and I loved it, thank you! is there any info on the number of weight watcher points per serving? This looks delicious. Does this come out chewy or soft? My husband has braces and he can’t eat chewy food. Thank you!!!! When I made these, my batter was really thick. Should I just add more milk? I used Bob’s Red Mill Old Fashioned Rolled Oats, which are kinda large, and I followed the recipe so I don’t know why mine is so thick and not runny. Any suggestions? I think they will be fine. How thick? Difficult to stir thick? or Pudding like? You could add 1/4 cup more milk if you’re worried. Often people have complained that they were in fact too moist because they were expecting it to be like a muffin. It is definitely not the texture of a muffin. Thick to stir. I’ll try adding another 1/4 cup of milk and see! Thanks so much for replying! Your recipes are amazing! Thank you and you’re welcome. You could also add an additional 1/2 cup applesauce too. This is the best!!! Thank you so much for sharing it with us. I’m having a breakfast with several friends and I will add these to the menu. so i’m a person who gets up and goes to the gym early in the morning before work, and i was wondering if you get full enough off of one of these to last through a workout instead of having to get up earlier to make a bowl of oatmeal? Yes, one is very filling for most people and plenty before a workout. Finally got around to making these, and they are YUM!! And I actually got 18, just like you- I used big, heaping 1/4 cup scoops- plus maybe enough batter for one more. Thanks!! THANK YOU for sharing how many you got, I appreciate the support! Any idea what the sodium, cholesterol, or sugar counts are per serving? I edited the nutrition info to update that information for you. I’ve made these a few times now and we love them. Always looking for a quick but healthy breakfast to eat on the way out the door! I’ve played around a bit with honey and stevia and toppings and they have ALL turned out great. Made a batch for my ECFE group and then had to pass your blog on to all of those moms as they were so impressed too! I think next time I make them I may add some protein powder (or maybe more eggs) just to round them out even more with a bigger protein punch. If I do it I’ll come back and post to let you know how they came out! Thanks for the great idea and I think I am going to make your original baked oatmeal for an upcoming family gathering! I’m so glad everyone enjoyed them, thanks for sharing! I made these this past weekend, and what a hit in my household!! I have kids who DON’T like oatmeal, and they had no idea that was what they were eating. We just told them they were eating muffins, or cupcakes as my daughter called them!! Really good warmed up, with a bit of milk, and 1/2 tsp of brown sugar on top!!! YUM!!! I also used quick oats, cause I did not have rolled oats, and they turned out fine. I think I cooked them for an extra 10 mins but they were done!! Not mushy at all. I also got 24 out of the recipe that you posted. But instead of Stevia, I used brown sugar. Used 1/4c per serving to dish out. Will be making these again this week. Easy snacks, inbetween meals. I’m glad to know quick oats worked as well, thanks for sharing! That’s why I made them since my oldest picky child HATES anything that resembles oatmeal in a bowl LOL! I absolutely love this idea. Thanks so much for sharing!!! I made these last week and they were perfect for breakfast every morning! I sprayed the muffin liners with non stick but I still found that almost an entire layer stuck to the paper. Is this normal? Or is there another fix I can try? You could try using a silicone muffin pan instead. I have and didn’t use liners and they popped right out. Ours usually stick a little but not as much as you are saying. I don’t have that written anywhere on my page, where are you reading that? I just clarified it. I’ve had too many other bloggers copying my entire recipe, directions and pictures for their own blog. Someone may have already asked this and if so I apologize for the additional question. Is the flax seed meal necessary to the recipe or is just a way to get additional fiber? Or perhaps both? Thanks!! We need a recap of all the variations. I would like to do this with NO flaxseed and NO banana and NO stevia. Can I JUST eliminate these or do I have make substitutions. If I have to substitute I don’t mind using honey/brown sugar or applesause/pumpkin. Can anybody tell me what I should do or how I should make this then? THANK YOU! Just made some additions to notes above for you. Where might find these additions to the notes? Thanks, I am still surprised you say to substitute something for the banana when a lot of people have said they omitted it. I am going to try it with the extra applesauce first. I agree that the canned pumpkin wouldn’t be sweet enough. Finally going to make these today! I need a healthy breakfast for on the go. Discovered your site and this recipe on Pinterest. Thrilled to come across this recipe! I just made them. Thumbs up! I’ll be making them again. I plan on making them as mini-muffins next – great for a snack. Thank you for sharing this recipe. Pureed mango can also easily be used in place of the banana. I would know, thanks to a sad banana allergy. I made these and they were SOOOO good! My husband and I had them for breakfast the whole week, very yummy and satisfying! I made a few with raisins and cranberries just on top, not in the batter… and the berries burned 🙁 It looks like you made some with raisins on the top of the muffins… did you do anything to help keep them from drying out and burning? I just ended up picking them off the muffins, the muffins were still perfectly fine! I’m so glad you liked them. My raisins didn’t burn. I never tried dried cranberries. Maybe pushing them more into the batter rather than sitting on top would work better for the dried fruit. yay! my hubby loved these with some choc chips on top. let them cool before trying to remove them, they are slinky when really hot out of the oven! i got 24 FULL muffins out of these. don’t use paper muffin wrappers though, they get so soggy, you can’t hardly get them out without them tearing. i used the 1/2 cup honey in mine. might use stevia next time. very soupy mix but turned out great! not sure why i got so many out of them and you got 18 but oh well! they were good! Thank you for this recipe. I’ve been addicted to these for the past month or two. I just made a double batch tonight. My favorite add ins are butterscotch chips and slivered almonds. Thanks!!!! I would love to make these, wondering if there is a substitute for applesauce? I have son that is allergic to apples. Otherwise these look perfect for my kids. You all are so concerned over substituting this and that, but the most important thing is that you use ORGANIC oats. If you don’t, you are using oats that have been treated with Roundup, the highly toxic pesticide that has taken over all the “regular” products in our US food supply — like wheat, corn, oats, soy, cotton… And you’ll be doing big harm to your family unconsciously. Sharon!!! OH MY GOODNESS!!! I was expecting to read the worst as I began reading what happened! You totally fooled me and all I can say is THANK YOU for sharing your mishaps and outcome! I just found your site and i LOVE IT!!!! I made these today. Used some truvia and splash of honey. Halved the recipe too since i didnt have enough oats in the house. They are soo delicious! The thing is, i wanted to give it to my kids as snack/breakfast, but mine came out very very moist, maybe even too much that it falls apart (like on the mushier side?!!?) Anyway, have any idea? Should i bake them longer? Thank!! also, do you think i can use oat flour instead? would that help the consistency? I just tried giving my son one and in his hand it fell apart 🙁 if so, how much oat flour? I think its worth a try. Thank you! I would say to use less applesauce, reduce by 1/2 cup if you want them less moist. be very careful calling this gluten-free. Most oatmeals and not gluten free. If you are planning to serve this for someone with celiacs you will need to find gluten free steel-cut oats and adjust recipe accordingly. That is clearly stated in the additional notes above, thanks! Are the bananas necessary for the baking process, or is that just for flavor? Because my fiance is allergic to them. Yes they are. If you need substitutions due to allergies to banana, please check the questions/substitution post above. Made these this evening. They are soooooooooooo yummy!!!!!!! Thank you so much!!!!! Oh WOW! These look amazing! Ive been trying for a health kick for me. But with a naturally skinny husband and three spoiled kids its hard to make one breakfast to satisfy the masses. Im going to HAVE to give these a try. Thank you! Made these last night and they are fantastic! I did not have flax seed but I did use wheat germ as a substitute. I also ran out of honey (only had half the amount of honey it called for) so I used raw sugar to make up for it. Thanks for a great recipe! I tried my own variation of “chocolate covered strawberry” ones. They are delicious! Mix in strawberries (fresh or frozen) and top with chocolate chips. Yummy!! I probably missed the answer to this in the comments… Could soy or almond milk be used in place of regular milk? This recipe was awesome!!! I replaced the flax with the same amount of ground chia seeds, and used the 1/2 cup of honey (which was too sweet for me, but perfect for my husband and daughter). When they were hot, they were very crumbly, like others have noted. However, they kind of “set up” after they’ve sat for a while. LOVED them! Loved it! This recipe is wonderful – I am putting the leftovers in the freezer and can’t wait to see how they taste as a quick pre-made breakfast! Made this this morning and they are delicious! I used chia seeds and almond milk, and topped some with chocolate chips and coconut and some with dried fruit. These will make great lunch snacks for the kids, thanks for sharing. BTW I got almost three dozen out of this recipe? Absolutely fabulous! I’m on the down hill side of 2.5 years of WW (72 lbs down, 40 to go) and my biggest obstacle is what to eat between work and work out. Something for energy without points. Something that will last without the big drop in the middle of the session. I think this might be it (added walnuts for some protein). Delish and filling. Thanks for sharing! Congrats on your wonderful weight loss! You are a freaking GENIUS! These are amazing! Just baking the last of them. These are amazing! I made some regular sized and some mini for my 14 month old. He ate 3 of the minis this morning! Thank you for sharing your recipe! I made these this weekend because my hubby requested a healthy snack for work. I baked them without cupcake cups by greasing the cupcake pan. I followed the recipe and topped half of them with raisins and half with chocolate covered peanuts. They were delicious! I threw one in the microwave for 45 seconds to thaw and I was surprised at how good they were after being frozen. Slather with a dab of peanut butter….yummy! Thanks for the great recipe. I am a little confused – is the recipe sugar free? Because you have chocolate chips and raisins on some of them, and I know they aren’t sugar free. Did you mean there is no added sugar? The basic recipe is 100% free of added sugar- toppings not included. There is natural sugar in banana, there is natural sugar in applesauce. Love this recipe. Do NOT love the “Print Friendly” button that will print 135 pages of the site (including all the comments). I made these last night with coconut milk, dried cranberries, chocolate chips and coconut flakes and they were YUM! I think macadamia nuts woudl be a great addition to that combo. Oh, I also chucked in a little brown sugar instead of honey. I have been getting into ‘making ahead’ breakfasts and snacks to take to work and am hoping that these freeze well and taste nice defrosted (but not heated up) as they would be a better alternative to taking squares of flapjack to work with me (muchos butter and golden syrup). I’ve made these twice and am about to make my 3rd batch. I eat one every morning with my protein shake and it keeps me filled up better than anything else. It’s just me, so I vary the toppings I put on by doing either a 3rd or 4th of whatever I get out of the mix and adding toppings….pieces of fresh strawberries, fresh banaba with a couple walnuts chopped, a tablespoon of peanut butter swirled in (yum!). Oh…and I didn’t have the flaxseed until this batch and there was no problem leaving it out. Awesome recipe! I attempted to make these last night.. I’m not sure what happened but they stuck to my cupcake liners and were gooey on the inside even after being cooled and fulled cooked. How full should I fill the cupcake liners? I filled them almost to the top and it was a mess.. I can cook like no ones business but it seems like I don’t have the touch for baking. But I really want to try these again.. HELP!!! Did you make any changes to the recipe? They may just have needed to be cooked longer than I suggested. Ovens vary. Also, if you decide to try again you could always reduce the amount of applesauce in the recipe by half and it should be fine. We don’t like anything dry in our family, but I really don’t think reducing the applesauce will cause them to be dry. I use silicone liners instead of paper and they don’t stick and I spray the liners with cooking spray as well. I filled them 3/4 of the way full. Hope that helps and you try again. Thank you for this awesome recipe! I made the muffins today and can’t wait to have it with my morning coffee! 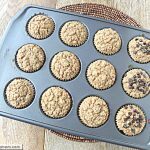 I found this Web site on Pinterest and loved the idea of having a healthy oatmeal muffin instead of me taking time and making oatmeal (that I didn’t really like anyway!). I posted a picture of my muffins on my blog (http://humble-yetnot.blogspot.com/) and shared the link to your recipe so others may enjoy these! I have made several batches of these muffins and LOVE them. Tonight I decided to stretch my baking creativity and added 4 tablespoons of organic cocoa powder, raisins and almonds to the mix. Turned out GREAT!! A little more chocolate next time and a little less Stevia, but still GREAT! Not sure what I did wrong, but this made WAY more than 18 for me! I overfilled my muffin tins, made 24 and still had to throw away enough batter to make 12 more. They smell super yummy though! Yeah I think Sugar Free Mom has very big muffin tins! I halved the recipe and it made exactly enough for 12 normal UK muffin / cupcake tins, so it would have been 24 if I had made the full amount. Will be a great breakfast for my hubby who is always in a hurry in the mornings! I think I might try using Pure Maple Syrup! Can’t wait to try! Are these really crunchy or do they come out softer and chewy? I have never tried to make anything like these, but have three young granddaughters who weem to like shewy granola. These are not crunchy at all, soft and moist. I’m so glad you both liked it! The calorie count does not include honey (I substituted it for stevia), correct? correct that is a substitution from using the stevia. Could you just mix in the topping ingredients with the batter before you fill the muffin cups? I would like to have a little bit with each bite. Yes you may need to use less batter in each cup. Just made a batch of these, using the honey, and they turned out DELICIOUS!! Thanks for the recipe. These look delish, but you should note that not all oats of GF. Only oats from outside the US or specially labeled oats are safe for people with celiac, due to cross-contamination during harvesting. I have noted that above in bold print. This seems like such a silly question…but do I need to prepare the oats first? Or just throw them in dry? No Need to do anything but mix them in dry. Thank you for sharing this recipe. These are amazing!!! I have a grandson who is a VERY picky eater…I think he would even eat them. I ate one warm with a little milk. If I had a B & B, I would serve these…for sure!!! Awesome! Thanks for the amazing recipe! I made them for the first time today and they are a huge hit with my entire family! I made some with blueberries and blackberries mixed in as well as some with dried strawberries on top- all delicious! I’m not sure if you answered this question previously or not but do you need to use flaxseed? I don’t have any nor do I want to buy it since it’s not something I will ever use in the future. I just made these with blueberries included in the batter and raisins/craisins and almonds on the top — they were wonderful. The blueberries added a lot of moisture to them so I hope they stiffen up a bit after they cool completely. I know that you said they could be frozen, but for every day storing, should I keep them covered on the counter or refrigerate them? Keep refrigerated. They should firm up by tomorrow morning.